Pleatco Blog | Discover all the latest about our products, technology, awesome articles with tips and our culture on Pleatco's blog. How Does Rain Affect My Pool Water? This is a very common question among pool owners. They ask us, “is there anything I should do to my pool after it rains?” It’s a good question and the answer is YES! There are a few things you should check after a heavy rain. Rainwater can sometimes affect your pool’s water chemistry. Rain is known to have acidic properties that can negatively impact your pool water chemistry balance. 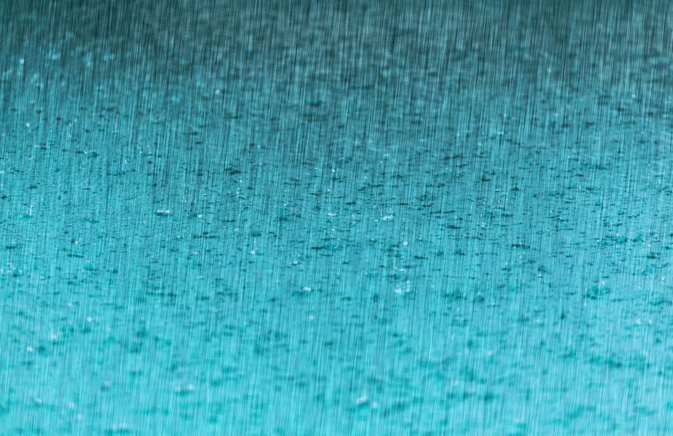 Rainwater can affect the pH balance, alkalinity levels and more. After a heavy rain, you also have a lot of extra water in the pool that can dilute the chemistry and chlorine levels. The extent of the chemistry issues you’ll experience will depend on how much rain you get. A light rain, for example, should have very little affect on your pool water. But to be on the safe side, it is always best to be certain that your pool water chemistry is properly balanced at all times. Keep ahead of the changes to your water by testing frequently during heavy rain periods. After a heavy rainfall, follow these simple steps. 1. Clean the pool if the rain came with heavy winds that could blow dirt, leaves, or other debris into your pool. Skim the pool and the vacuum with an automatic pool cleaner or manually vacuum the pool. 2. Run your pump for at least 12 hours a day to ensure proper filtration and circulation. This helps remove dirt and debris, along with circulating the existing chlorine in your pool. 3. Next you want to check the water chemistry with test strips, especially the pH, alkalinity and sanitizer levels. Acidic rain can cause your pH to drop. Note: Your alkalinity levels might see a more drastic change than your pH levels. Keep a close eye on your chlorine or sanitizer level. It common for chlorine levels to drop so low that it leads to cloudy water or algae. Smart Tip: Speak to a local pool professional for assistance on re-balancing your pool water after a heavy rainstorm. 4. Watch you water levels. You want to drain excess water, bringing your water to an appropriate level for proper skimming. If you have a Diatomaceous (D.E.) or Sand Filter with a multi-port valve, you can simply put it from vacuum to waste mode, or just let the pool drain until it’s back at the normal level. 5. Shock your pool after heavy rains in the evening. This will fight off issues with what the rain has brought into your pool and reduce the risk of cloudy water or algae due to low chlorine levels. Have a great summer by the pool!!! Reason #1: Chemically treating a pool properly can be very frustrating for pool owners. Proper chemical treatment will ensure the health and well being of your family. The proper amount and levels of chemicals often requires more knowledge than many pool owners possess or want to learn about. Pool professionals may visit over sixty swimming pools per week on average. Each pool is unique and may have different needs and requirements. Pool Service Professionals have the tools, chemicals and experience to create a worry-free experience for you! Pool Service Professionals provide expertise that goes well beyond weekly maintenance. · They will be able to inspect for any leaks or equipment that needs repair as well as diagnose exactly what chemicals your pool will require. · They create a complete chemical analysis of your pool water, and add make adjustments as needed. · A pool professional will properly maintain your pool equipment. There are a lot of moving parts and any small mechanical issue can dramatically affect your pool’s operation and filtration process. · Pool professionals will use preventative maintenance techniques to save you time and money as your pool starts to age. 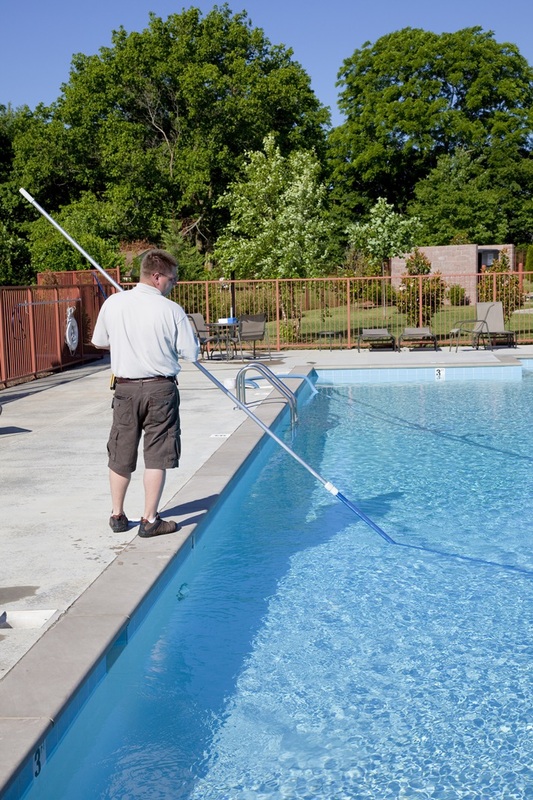 · During closing, a pool professional will remove the ladders, handrails and stairs, winterize the pump, filter and heater, winterize lines, add chemicals and replace the pool cover. Reason #4: Hiring a professional also reduces the issues and risks of storing chemicals. Chemicals should always be stored in a safe and dry location not impacted the weather. Did you know that pool chemicals, such as chlorine could cause rust to whatever they are around. That includes pool equipment, tools and even your car if stored in nearby in a garage. Homeowners should also be aware of the safety issues with storing chemicals. Example: Calcium Hypochlorite based shock (the most common form of shock) is a highly flammable oxidizer. If mixed with Tri-Chlor or many other organic compounds it will catch fire. A swimming pool service company will eliminate the need and risks to store anything at your home. Reason #5: Relax, enjoy and have fun! Perhaps most important reason to hire a pool professional is to relax, enjoy, and have fun in your pool! This is why you own a pool. Knowing you have a competent professional taking care of your pool can give you peace of mind and help you save money and time. Thanks for taking the time to read our Blog post. We would love to hear your comments. Do you know what’s in your fill water? Pleatco Pool and Spa Professionals frequently work with customers who are dealing with problems associated with water high in mineral content. The most troublesome minerals are iron, calcium, and manganese. Pool and spa owners, often describe water that was at one moment is crystal clear and then over night quickly turns rusty, brown, green and even causing staining. Where do these minerals come from? Minerals like iron, calcium and manganese exist naturally in water sources use to fill your pool or spa. Well water is notoriously high in mineral content but your tap and ground water can also be high in minerals. What’s happening that causes this? Minerals can become a problem in the water when they react with chlorine or bromine. When the minerals come in contact with oxidizing agents such as chlorine or bromine they react by quickly changing the color of your pool or spa water, and sometimes even causing staining. So is there a secret to preventing these problems with better fill water? Yes! Overcomes the problems associated with using tap, ground and well water when filling or topping off your pool or spa. We are here to help! Our Free Hotline is open during business hours 9am – 5pm M-F (EST) at 800-866-5160 and we respond to email orders@pleatco.com inquires within one business day. Myth #1. My hair turned green because there’s too much chlorine in the pool! Fact: Green hair is sometimes associated with swimming. The green color is most obvious in blonde hair, but chlorine is not the culprit. Green hair after swimming is the result of copper not chlorine! Copper is an active ingredient in most pool algaecides, it’s present in fill water, and can also enter a pool by way of corroded copper plumbing. Myth #2. You can’t swim for an hour after eating. Fact: Many children are told that swimming on a full stomach is dangerous because you might get a cramp, leaving you unable to swim and this could lead to drowning. This might be a helpful parenting technique to get your child to take a break from the pool, but there is no scientific evidence to support this. Eating within one hour before swimming does not increase the likelihood of getting a cramp. We don’t recommend eating everything in sight before going in the pool. Use common sense and eat in moderation before swimming, and remember to stay hydrated even though you are in the water! Myth #3. The heavy chlorine smell around a pool tells you there is too much chlorine in the water. Fact: A properly disinfected pool actually has no strong chemical smell. Chlorine is not actually causing the smell. It’s chloramines in the water that cause that smell. Chloramines are formed during the reaction of chlorine with sweat, urine, and body oils. The heavy chlorine smell is actually a sign of an under-chlorinated pool. These are pools that do not maintain a normal level of 1-3ppm chlorination. Myth #4 Chlorine gives people red eyes during swimming. Fact: You may have experienced, or seen, the dreaded symptoms of red eye after swimming. Irritated, itchy red eyes are commonly blamed on an excess of chlorine in a pool, but that is almost never the case. While swimming pools can indeed provide irritations, the culprit is actually chloramines, that by-product of chlorine mentioned above in Myth #3, which results from an improperly, often under-chlorinated pool. Pools that maintain a normal level of chlorination (the aforementioned 1-3 ppm) will not cause such symptoms. Thanks for taking the time to read our Blog post. We hope this clears a few things up, and that the knowledge gained from this post will help you and your family enjoy your pool experience pool even more. We love our swimming pools, but occasionally you might have some frustrating problems with cloudy water. There are many factors that can lead to cloudy water. Common issues include, water balance, lack of chlorine, filtration problems, weather and increased swimmer usage. Step 1. Start by running your pump 24 hours a day until we get the cloudy water cleared. Step 2. Test your water by using a home test kit or by taking a water sample to your local pool dealer. Make sure your pH is between 7.2 and 7.8. Total alkalinity should be 80-125 ppm. If your pH and/or your total alkalinity are high, add a pH decreaser. If these levels are low use a pH increaser or total alkalinity increaser. Smart Tip: Always pay close attention to your chlorine levels. Lack of chlorine in the pool is the #1 cause of cloudy water. Maintain a chlorine level of 1-3 ppm. Always be sure to read and follow the label instructions on any chemicals added to your pool. Step 3. Clean and or backwash your filter. Cloudy water can be caused by poor filtration. Step 4. Shock the pool with a chlorine shock. Follow the shock label instructions. Smart Tip: When conditions change adjust! Shock after heavy rains, increased pool usage, and after removing debris on pool floor like leaves. At Pleatco we are driven by an innate desire to build the highest quality products possible.We live by the mantra of ‘constant improvement’ in every facet of our business.